Welcome to our 21st Global Design Project Challenge! This one we can thank Brian King for - it sure is a challenge - but we know you are all up for it. It pushed me to my limits and I believe bought out something in my that I am very proud of! So don't get intimidated by this challenge. If you try something that is out of your comfort zone, you might be surprised what comes out! As soon as I saw the colours I instantly thought of Ice-cream. I thought that many of the other designers would be the same, yet we all have so many different ideas which is so fun! I used the Sale-a-Bration stamp set Honeycomb Happiness. It has so many adorable images in this set. 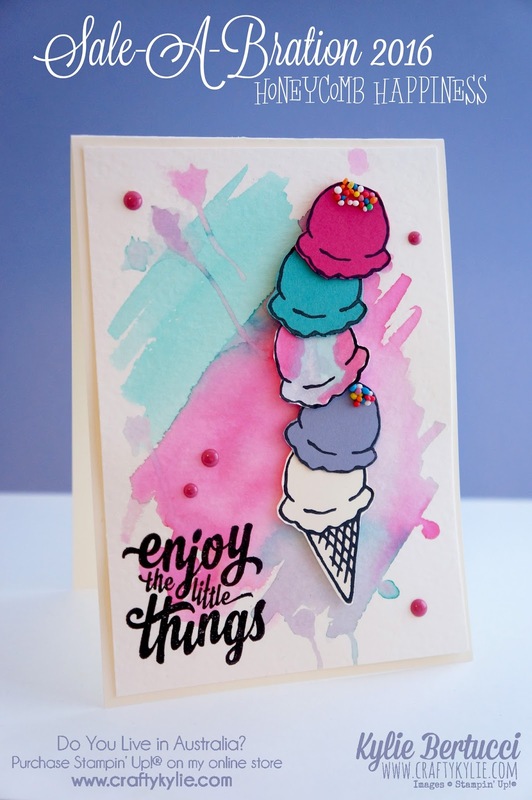 To do my Ice-cream I was inspired by my downline Carolina Evans who used this set in a recent blog hop my team did with Connie Stewart. I thought it was so clever! I adapted it and decided to go with the watercolour background on watercolour paper. The ice-cream scoops were fussy cut - I LOVE fussy cutting, yes strange I know. I stamped them on the coloured paper and then cut it out. The hundreds and thousands - are just that! I raided the cupboard and got some - added tombow glue and put them on! How fun! Bruno was looking very scared when he saw me with them. I think he was thinking - this is going to end in a mess. 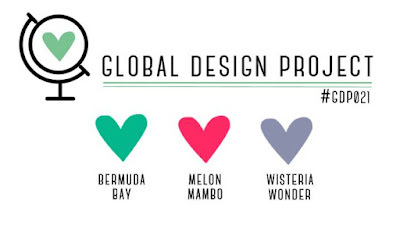 So head over to the Global Design Project this week to be inspired or play along! We are having so much fun encouraging new and developed talent. Many doors and opportunities open to you when you play along with us. I am not sure if you have heard that I am a periscope addict? Here is my scoping for today! Click Here. Thanks Sue! Of course you love it and its Ice-cream and who doesn't love that? 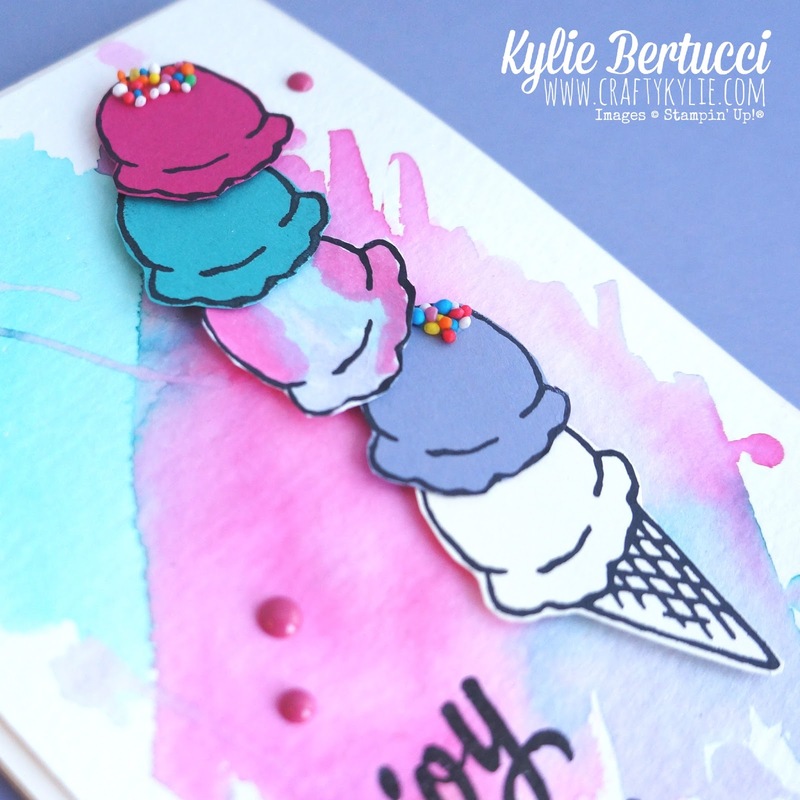 Awww gorgeous CASE of my card Kylie - looks so good I could eat it! Yes your card inspired me big time Carolina! Thank you! Love this! The colour combo has stepped right out of the 80s and you rocked it! Thanks Susan! Yes super fun Colours. Brian did really well. Love this card! Always forget to use the watercolor paper. Love the Periscope updates as well! How do you join in the chats? Haven't seen a button to hit while you are live. Thanks! I really love the colours in this card. It is so bright and happy... happy for ice cream too. I hope i dont offend as your cards are really good but i think this is your best one yet.I love everything about it. Your card is so yummy!!! Love the brightly colored watercolor background and ice cream cone. The black sentiment is just perfect! Such a beautiful card Kylie! I love the watercolor background. It gives such a great feel to the card. Such a cute card. I love the water coloring you did. And, all those scoops of ice cream are yummy! Has there ever been a more fun card? I love how you've used these colors, Kylie. Heaps and he heaps of fun. I looove this card Kylie! Your attention to detail is amazing! 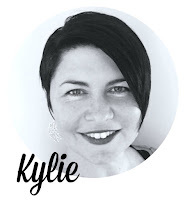 Not only is your card a visual treat Kylie, I know if I licked it, it would taste great too!! !